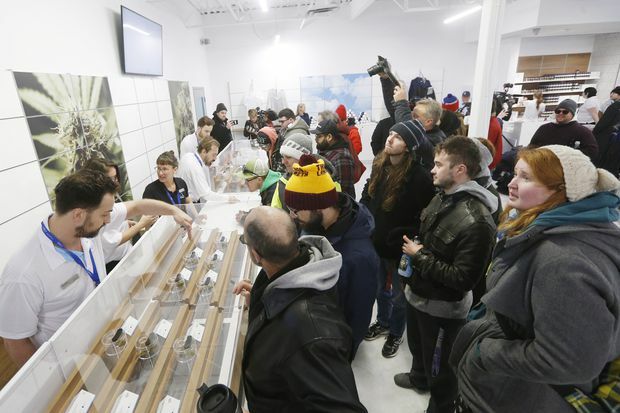 People check out the sample counter at a cannabis store in Winnipeg, Man., on Wednesday, October 17, 2018. Marijuana is now legal in Canada. Provinces are pushing cannabis producers to speed up shipments after consumers lined up and cleaned out much of retailers’ inventory on the first day of legal recreational sales in Canada. Amid celebrations across the country on Wednesday, websites and stores sold out of many brands and strains in hours as customers endured lengthy lines to be a part of the historic day. Licensed producers are “obviously really trying to be good partners to the various provincial regulators, but we’re not meeting expectations. Nobody is,” said Vic Neufeld, chief executive of Leamington, Ont.-based grower Aphria Inc., adding that supply issues will likely plague the industry for several months in part due to a lack of consumer data. He said the industry needs two years of data to really understand the cycle of forecasting. Warning signs of a supply shortage had been mounting in the weeks leading up to Wednesday’s legalization, sparking worries that the debut of pot sales might be bumpy. Earlier this month, four provincial distributors said growers had shipped fewer products than expected, so consumers would have fewer choices. The situation could have been worse on Wednesday if more bricks-and-mortar stores had opened in time. British Columbia, for example, only had one storefront open on Wednesday, Alberta was slated to have fewer than two dozen, and Quebec was expected to open 12 outlets. Ontario had none, relying only on online sales. In Ontario, the products disappeared from the province’s online store as they quickly sold out. By noon, only one product made by Canopy Growth Corp. – one of the country’s largest growers – was still listed on the site of the Ontario Cannabis Store: a 3.5-gram bottle of DNA Genetics-branded flower called Lemon Skunk, going for $44.15. Canopy CEO Bruce Linton said his company has 100,000 more units of cannabis to send to distributors across the country in the next week, with shipments planned each business day through at least Monday. On Wednesday, it shipped more cannabis to Ontario’s provincial warehouse. Meanwhile, British Columbia saw similar activity on Wednesday. Shortly after 9 a.m., 48 of 97 available flower products were sold out on the B.C. cannabis online store. He said OCS will provide sales data as they’re “verified and available.” Mr. Roderick said in the event of a Canada Post strike, which its union members are threatening by Monday, OCS is evaluating alternative options for deliveries. By late afternoon, a warning for buyers appeared at the top of the OCS website in red font: “Expect your order to be delivered within three to five business days.” The OCS had been targeting a delivery time of one to three days. In Newfoundland, where the first Canadian legal sale occurred at 12 a.m. on Wednesday, health-and-wellness store Healthy Vibe turned away hundreds of people, owner Megan Kennedy said. While some products were still available on Wednesday morning, most of the marijuana-flower products were sold out. Trevor Fencott, CEO of Edmonton cannabis retailer Fire & Flower, said it was able on Wednesday to keep its three stores in Alberta and two in Saskatchewan stocked despite lineups around the block, with hundreds of people in line. Currently, Fire & Flower is carrying about 80 types of products in its Alberta stores rather than the 300 it would like to stock, he said. Shopify Inc., which provides the technology for four provincial online stores in Ontario, B.C., Newfoundland and Prince Edward Island as well as a number of private retailers across the country, said it had seen millions of visitors placing tens of thousands of orders in the first 12 hours. Spokeswoman Sheryl So said the company expects hundreds of thousands of orders in the first 24 hours and “millions” when the first week of legal sales concludes. There were 100 transactions a minute in the early hours of sales on Wednesday, Ms. So said. Shopify technology is used by sellers Tweed, Delta 9 and Jimmy’s in Saskatchewan, which were live on Wednesday, and Hiku and Manitoba’s NAC, which were scheduled to go live this week. A Tweed store, owned by Aurora rival Canopy, in St. John’s said it did not receive an order of expected Aurora product for Day 1. While consumers demand for cannabis was strong, investor desire on Wednesday for the companies’ shares was not. Many pot stocks hit all-time highs on Tuesday, the day before legalization, then fell sharply in early trading on Wednesday. But most stocks quickly pared their losses and finished the trading day down just slightly. Several gained moderately, with Aphria closing up 3.8 per cent.